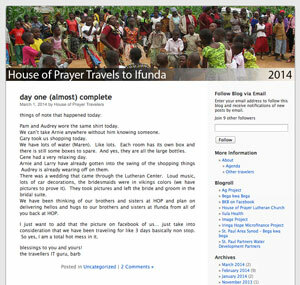 House of Prayer Lutheran has had a partner parish in Ifunda Tanzania for over 15 years. We stand “shoulder to shoulder” (Bega Kwa Bega in Swahili) to proclaim the gospel and to support each other through prayer and relationships, offering each of us the opportunity to expand our worldly horizons and grow in our faith. We have helped our partner parish purchase bicycles for Evangelists and a motor bike for the Pastor. We have provided funds to roof and cement eight preaching point churches, scholarships for education and much more. Our latest project is helping our partners improve their crop production through the Ag Project. Dozens of our members have traveled to Ifunda, Tanzania on mission trips to strengthened our relationship. Each year the Ifunda mission group hosts the Community Christmas Breakfast to support our companionship with Ifunda. Since 1998, the St. Paul Area Synod of the ELCA has been involved in a partner relationship with the Iringa Diocese (synod) of the ELCT, which is the Evangelical Lutheran Church in Tanzania. Over the last 11 years, this relationship has linked local St. Paul congregations with parishes in the Iringa area (central highlands) of Tanzania, and over 60 such sister congregation relationships have been formed. House of Prayer began its sister connection with the Ifunda parish in 1999, and we have enjoyed an ever-expanding relationship during the last 10 years. We support one another in prayer and care, and HOP commits $1,000 each year to help the ministry efforts of Ifunda. In ’01, ’03, ’05, ’07, ’09, ’11 and ’14 HOP has sent groups of travelers to Ifunda, where our “missionaries” were graciously welcomed into the incredible excitement and love of the believers at Ifunda. In ’06, we provided the opportunity for the pastor and others from Ifunda to travel to St. Paul to share life with us. These visits have strengthened and cemented relationships by enabling the travelers to better understand the culture, faith, and life of our sisters and brothers in Christ across the world. Over the years, we have supported the Ifunda parish in various special ways, including monies to purchase coffee plants, fertilizer, insecticides; bicycles for the evangelists and a motorbike for the pastor; roofing materials and cement for the various “preaching point” churches; equipment for new wells and clean water; a new home/parish office for the pastor and his family; and generous ongoing support for secondary school scholarships. For most Tanzanians, life is an enormous struggle for water, wood for cooking fires, adequate food for the family, school fees for children and medical care. Subsistence farmers, who make up the majority of the population, face periodic droughts. The Iringa Diocese is divided into two main areas, the highland zone and the lowland zone. Our companion church, Ifunda is in the lowland zone. This area consists of mainly tall grasses and bushes. Most of the parishes are connected with rough and seasonal roads. Travel during the rainy season is very often difficult. The rainy season starts in November and ends in May. The remaining period of the year is the dry season. People in the Ifunda area grow corn, beans, tobacco, fruits, coffee, and trees (for timber). They often keep animals like cattle, goats, sheep and chicken.